When I was 14, I was lucky enough to be involved in my first relationship. The person I was dating was in my class at school, and they were friendly and reasonably cute. One day, I asked them out and they said yes – being the excited kid I was, I told a few of my friends about it. Deadpan, the coach replied, “Really? What’s his name?” and started to laugh. I got slightly annoyed, but just went along with it – after all, I should’ve expected to get teased, and they didn’t mean anything by it. At the time, I didn’t know just how common homophobia was in sport – in a survey by Out on the Fields in 2014, 87% of Australian respondents said they ‘perceived homophobic jokes around sport’ sometimes, often, or always; while only 30% felt that youth sports teams were a supportive and safe environment for queer athletes. I also didn’t know I was queer myself. If I’d known, and been open about it, at the time, then the coach probably wouldn’t have made the joke – which leaves us with new problems. Just because there’s nobody queer around doesn’t make it safe or okay to be homophobic – which is where the AFL’s Pride Game comes in. The Pride Game is now in its third season, although there was a preseason clash in 2015 that had the same theme. 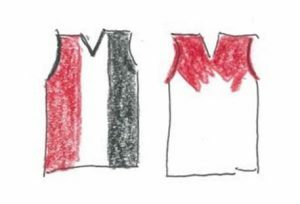 Now a regular fixture between the Saints and Swans, the game serves to make the AFL a more open and supportive place for queer football fans. As the Record proudly declared, “the theme of this year’s [pride] game is I’ll Stand By You, an ode to the importance of family and support networks amongst the LGBTIQ* community”, and it was hard not to feel supported during the pre-match celebrations. Rainbow flags were being dispensed liberally, large sections of the crowd had special rainbow merchandise, and the Saints went out to play with rainbow numbers (which led to a slight problem, being hard to make out from a distance). Even the advertising got in the mood, with a major brewing company declaring ‘Everyone’s Welcome at the Pub’ – the irony wasn’t lost on this teenage journalist. Probably the strongest show of support wasn’t on the field, but off it. 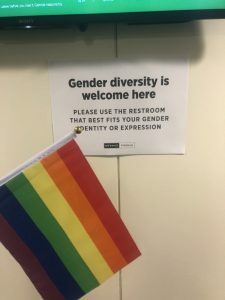 Paper signs on the wall outside the toilets declared that ‘gender diversity is welcome here’, telling patrons to use whatever bathroom best suited their identity. Having trans friends who regularly struggle with the bathroom dilemma, it was great to see measures being made to ensure everyone was welcome. But there’s still one thing missing from the AFL’s inclusive campaign, and that’s an openly queer player. There’s probably hundreds of young footballers around the country, coming to terms with their sexuality, who don’t have a strong role model to look up to. The fact that no AFLM player feels safe enough to come out – and they’re probably justified not to want to, given all Hannah Mouncey faces – is a huge indictment upon us all. Look at Adam Goodes. He should go down as one of the best players of our generation, but he was hounded out of the game for making a stand against racism. At this stage, it’s hard to see how anything different could happen to the first player to come out. The AFL could help bring us real change. Suspend players for homophobia. Make the bathrooms neutral for every game. Ensure the queer fans and players feel as safe at the stadium as they do at home. Then we can watch you fly the rainbow flag, and know you believe in it. *For anyone curious about the terminology here: LGBTIQ stands for lesbian, gay, bisexual, transgender, intersex, and queer. I’ve used queer throughout the article as an umbrella term, which includes all of the others. Nick Fredriksson is proudly bisexual and a teenage sports journalist. Well said Nick, well said. Bad luck about your Record spoilage incident. Thanks for your perspective on this, Nick. There is a very long way to go in this regard. I think an openly queer male player (noting the very different context in the AFLW) would now be accepted… as long as they weren’t troublesome (sarcasm font) like Adam Goodes and vocally demand fair consideration. There’s a big leap between (bare) tolerance and acceptance. Hopefully we’re building towards that. Thanks Dave. I think a reason there’s less pressure in the AFLW is because the sort of people who’d harrass a queer AFLM player are the sort who complain about AFLW. And if one player did come out, there’d be a massive target on their back, and I don’t think anyone wants to have that responsibility.